SureFlap Microchip Pet Door Connect White Cat/Small Dog Flap ID MicroChip. Please make sure this is what you are looking for. The previous buyer said it was too small for his cat. It fits our ‘normal’ sized cat! This was put in a door but the cat never used it . It does work and also has the adaptor for installation in windows and a spare door. Dispatched with Royal Mail 2nd Class. 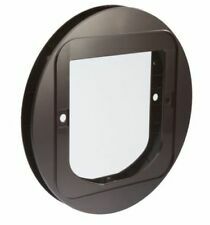 SureFlap Microchip Cat Flap - Brown. SUREFLAP CAT FLAP WITH MICROCHIP IDENTIFICATION, WHITE, 21 X 21 CM. Condition is New. Dispatched with Royal Mail 2nd Class. 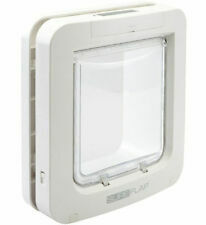 SureFlap Microchip Cat Flap with Mounting Adaptor (for Double Glazing If Needed). Condition is Used but in great condition. Dispatched with Royal Mail 2nd Class. Box and full instructions included. We’ve had new doors fitted so removed our cat flap (alas our cat is no longer with us) - it works very well only letting your cat/s in/out and with the option to lock it inward:outward etc. The round discs are removable, we used them because the hole in the double glazing was circular but in a wooden door they would not be needed. Any questions please ask. This is the larger version with Hub designed for small dogs and larger breeds of cat. Stay connected and give your pet freedom and security with a Microchip pet door. Combined with the included SureFlap hub, this pet door monitors when your pet enters and leaves the house and sends this information to the free Sure Petcare app you can download to your IOS/Android device. Brand New in retail packaging Sureflap Pet Door Mounting Adaptor - WHITE (2 Adaptors in the pack, one for each side of installation). Use to install your Sureflap Pet Door into Glass or Wall Mounting, can be used to cover holes in uPVC panels also. Recommended hole size is between 294mm and 320mm for glass installations. SureFlap Mounting Adaptor New In Packaging. Condition is New. Dispatched with Royal Mail 2nd Class. Selective entry but allows any animal to exit. The microchip reader is located on the outside of the cat flap only. 1 x Microchip Cat Flap. The cat flap is battery powered and requires 4 x AA batteries (not included) which will last up to 12 months with normal use. 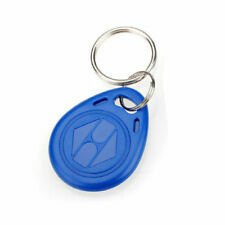 Ideal for cats/dogs that are not microchipped or in cases where the pet chip doesn't read well. Water resistant. SureFlap Microchip Pet Door CONNECT. MODEL- iMPD. Without Hub. White Large Cats Small Dogs Secure Entry Flap. NEVER USED. NEW, 100% original. £199(with hub). It is selective entry, while any cat can leave. A four-way manual lock can be used to keep resident pets in or out of the house. The cat flap can be installed in doors, windows or walls and because it is battery-powered, it can be installed virtually anywhere. The Pet Door Mounting Adaptor is required to install the SureFlap Microchip Pet Door into glass windows and doors. Pet Door Tunnel Extender For wall installations, tunnel extenders can be stacked together to create a longer approach tunnel to the SureFlap Microchip Pet Door or the Microchip Pet Door Connect when it is installed in a wall. The Pet Door Tunnel Extender fits snugly onto the 70mm long tunnel of our pet door. Each tunnel extender adds 50mm to the overall length of the tunnel. SureFlap / SureFeed Pack Of Two RFID Collar Tags - For Non-Microchipped Pets If your pet is not microchipped, the SureFlap RFID Collar Tag is available as an alternative*. SureFlap collar tags contain a code that is unique to your pet so that if other pets in the neighborhood have a SureFlap collar tag, or any other type of collar tag used in selective pet doors, they will not be able to gain access. *The collar tag is not compatible with SureFlap Microchip Cat Doors with a serial number of 1152201 or lower. 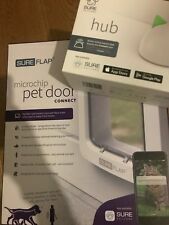 SureFlap Microchip Petdoor Connect Bundle. H28.1, W26.2, D7cm. Receive notifications when your pet enters or leaves. View graphs to monitor activity and spot changes. The height of the Sure Petcare Hub (part of the bundle) is 7cm, with a 17cm pet door flap opening. The 4-way manual lock enables locking to any combination of in/out. 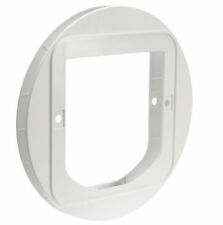 A SureFlap Mounting Adaptor is required for glass installations and one or more SureFlap Tunnel Extenders may be required for wall installations. It is a selective entry, while any cat can leave. SureFlap Microchip Cat Flap. Microchip Cat Flap Pet Door. A four-way manual lock can be used to keep resident pets in or out of the house. The cat flap can be installed indoors, windows or walls and because it is battery-powered, it can be installed virtually anywhere. Reads your cat's microchip to keep intruder animals out. DualScan technology lets you set exit permissions for each cat. Ready to connect (requires hub - NOT INCLUDED). Monitor your cat's activity and notice changes in behaviour. The SureFlap Microchip Pet Door is compatible with all common microchip types. 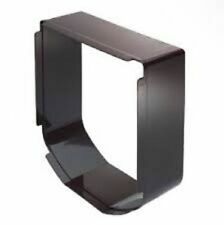 A pet door mounting adaptor is required for glass installations and a mounting adaptor and one or more tunnel extenders may be required for wall installations. Sureflap Connect Pet Door. Receive notifications when your pet enters or leaves. Monitor activity and notice changes in behaviour. Share access with friends and manage permissions. Microchip recognition ensures only your pets can use the flap. Studio: SureFlap. Model: Tunnel Extender - White. CLOTHING |. Orders will be fulfilled by our own warehouse or a 3rd party supplier at our discretion. Colour: White. We promise to do everything possible to put things right for you. The single tunnel extender is designed for use with the SureFlap Microchip Cat Flap and the DualScan Microchip Cat Flap. Each tunnel extender adds 50mm to the length of the tunnel. The SureFlap Microchip Cat Flap Connect with Hub lets you stay connected to your pets from anywhere. Stay connected and give your pet freedom and security with a Microchip cat flap. This cat flap reads your cats existing microchip and only opens for them. SureFlap MicroChip Cat Flap from Sure Petcare (alternatively the SureFlap MicroChip pet door for larger cats) is a revolutionary, battery-powered cat flap which reads your cat's existing identification microchip, only unlocking for them.